The potter carefully shapes the clay. His touch is gentle, yet his knife is sharp. The wheel always spinning, as the potter shapes the clay into a vessel with a special purpose. 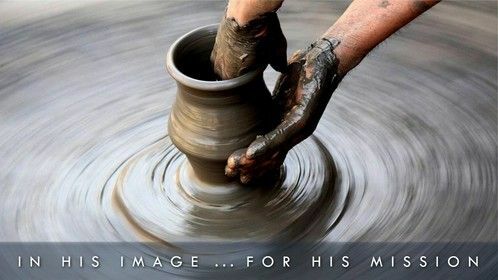 Just as the potter shapes the clay, so the Lord shapes us. Romans 8:29 says, He “predestined us to become conformed to the image of His Son.” Our destiny is to become more like Jesus. To think like Him, to love like Him, and to act like Him in every way. God is shaping us to look like Jesus and to live for Jesus. That’s what we mean by In His Image … For His Mission. That’s where the IMAGE acrostic helps. It’s a play on the word “image” in Romans 8:29. It paints a portrait of a disciple. It defines what it means to be a fully devoted follower of Jesus Christ. “I” stands for intimacy with God, “M” for ministry, “A” for authentic community, “G” for growth, and “E” stands for engaging people with the gospel. We see these characteristics throughout the New Testament; not as a checklist, but as a way of life. This is what a true disciple looks like. This is what a fully devoted follower of Jesus looks like. Yet, there is something all of us must admit. We have room to grow. We know we must narrow the gap between what we know and how we live. We must narrow the gap between being convinced of the gospel and being compelled to share the gospel. We must narrow the gap between merely saying we believe in Jesus and fully living for Him. The flip side of this paper lists ten characteristics of a fully devoted follower of Jesus. 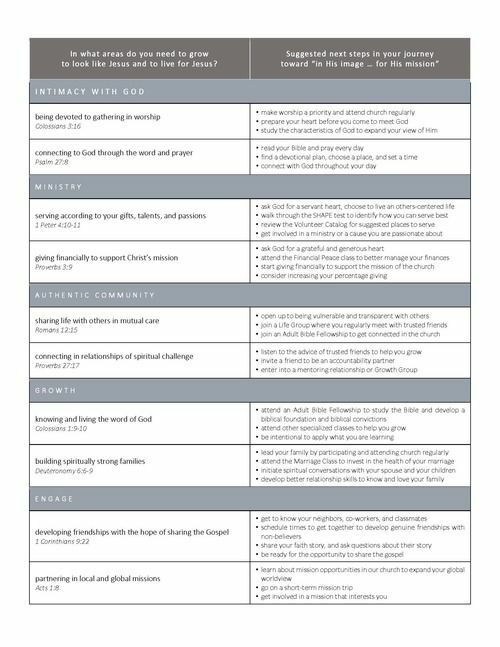 If you want to grow as a Christian, then take some time to work through these IMAGE characteristics. Let the Holy Spirit shine a light on the areas in which you need to grow. And make a commitment to take the next step, to living a wonderful life In His Image … For His Mission.